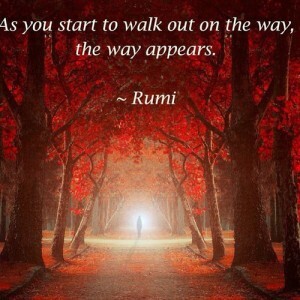 I am enchanted with Rumi's poetry even more than usual these days. My heart feels ripe for his kind of soul-full words, where he describes the essence of a person or a beautiful act of living; something real in a simple and profound way. His writings required attentiveness and carefully chosen words I am sure- though they offer a sense of ease when I read them. I am learning to invite ease into my life. A friend and colleague shared this wisdom with me the other day, and I was touched by it: There is plenty of time to be doing what you love. Aahh, yes there is. I am taking step by little step, and sometimes great leaps! I am learning to BE IN each step, to embody each movement with positivity, awareness, gratefulness for what is and what is coming to be. This is a moment-by-moment practice. A thought to ponder: Where could you invite more ease into your life?